If I had to pinpoint one thing that was the main cause behind the shocking suicide rate right now it would be this. This one thing heals most problems in time, but it’s one of the hardest things to do as a man. I strongly believe this makes you a real man… but the pressures of society would typically tell you otherwise. Because whether you like to admit it or not men have feelings too, emotions, negative thoughts and weaknesses that have a long term damaging effect if they’re not dealt with. Men have huge egos, fed by the modern society, the media and what we watch on TV, our fathers, our mates… this painted picture of what it takes to be a ‘real man’ is defeating us. A man takes his own life every two hours in the UK. Out of all suicides last year, 76% of them were men. Turn your ego off for a second, put aside the ‘banter’ and listen. Opening up and talking about how you feel is one of the hardest things to do as a man. We protect an image we create, a perception, and we protect a strong ego which is hard to control. We strongly believe opening up, talking about our weaknesses, pressures and emotions is a sign of being weak, feminine and unlike others. But it isn’t. It’s a sign of strength, power and a sign of you becoming the most successful person you can be. The majority of women find it easier to open up, they find it easier to let go, to talk about their issues with their friends… We don’t. Sure, the pub on a Friday night with 5 of your mates might not feel like the right place to let go and open up but it’s important you let go and open up somehow. 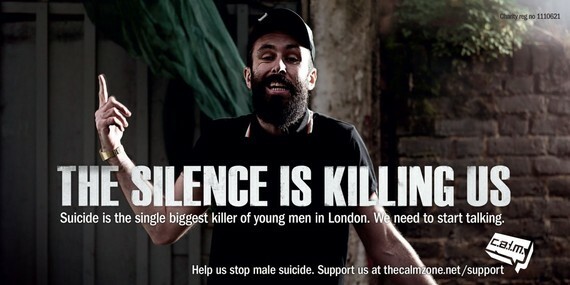 A close friend, a family member, a counsellor or even giving CALM a call (they have a support line at www.thecalmzone.net) will all have a huge effect on how you feel. I remember reading this and it’s probably the most manliness way of explaining the benefits of letting go. When you finally open up, let go of your issues and release your emotions the feeling is like a huge weight off your shoulders. It’s a feeling that will change the way you feel and secure a better future. Being able to talk about the challenges and pressures you face rather than using distractions for them is the biggest thing you can do. Real men deal with their issues and aren’t afraid to let go and open up. Burying your feelings and masking them with short term fulfilment is a weakness. It doesn’t show strength, it doesn’t show courage, and its hugely damaging your future. The options are there for you to open up… don’t be afraid.